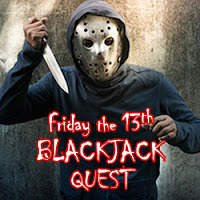 Gamblogger: Win a $50 blackjack bonus for hitting all 13 pairs during Friday the 13th Blackjack Quest at Intertops Poker! Win a $50 blackjack bonus for hitting all 13 pairs during Friday the 13th Blackjack Quest at Intertops Poker! Halloween at Intertops Poker and Juicy Stakes Casino is all about horror movies and a week-long "Friday the 13th Blackjack Quest". In their tribute to the 1980s slasher films, the online casinos will reward you with a $50 bonus for hitting designated winning Blackjack hands October 3 – 9, 2018. To complete the Friday 13th Blackjack Quest and win the $50 bonus, you must hit a pair of each card in the deck playing any of the Blackjack games under the Lucktap tab in the poker room software: Regular Blackjack, Double Draw Blackjack and Perfect Pairs Blackjack. There is an optional re-draw on hand 15, 16 and 17 in Double Draw Blackjack and in Perfect Pairs Blackjack a natural pair pays 5:1, same-colored pairs pay 10:1 and a perfect pair (both cards the same suit) pays 30X. The twelve Friday the 13th movies are classic thrillers focused on the fictional character Jason Voorhees. As a boy, Jason was believed to have drowned at summer camp. For decades later, the lake is thought to be cursed and is the setting for a series of mass murders. In all of the films, Jason, with his iconic hockey mask disguise, is either the killer or the motivation for the killings. "I've seen all the Friday the 13th horror movies a few times and they still scare me!" said Intertops Poker's casino manager. "Who hasn't had nightmares about Jason!?" Intertops Poker and Juicy Stakes Casino are the most popular online poker rooms on the Horizon Poker Network. In addition to their busy poker tables, they also offer slots and table games from World Match, Lucktap and Betsoft. Players from anywhere in the world are welcome. You have until Tuesday, October 9, 2018 to complete your Blackjack quest. The $50 bonus must be wagered 15X before it can be converted to cash.